Hello, lovelies~ Summer is upon us! No more rainy days and thigh-high flood for us in Jakarta. We are, however, facing the hot, steaming rays of the sun that will age our skin in the long run. I have talked about that topic a couple of times on my blog, but here is the link to a detailed explanation about UVA and UVB along with how they can age our skin. I always make sure that I have extra sunscreen in my bag during the summer months. 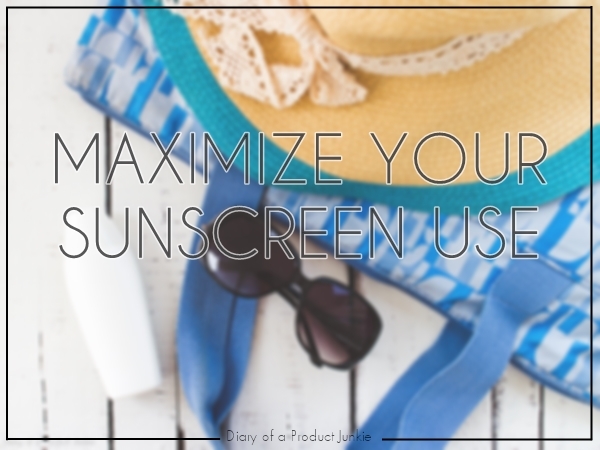 Here are a few tips on maximizing your sunscreen. There are so many sunscreens out in the market today that it is more often than not confusing. The simple way to choose the right sunscreen is to make sure that it protects you from both UV spectrum, namely UVA and UVB. Make sure that it has the SPF measurement (to protect from UVB) and PA measurement (to protect from UVA). Of course it won't be smooth sailing to find the right one, but you'll find one that suits your skin eventually. It took me two years to find 'the one'. Apply sunscreen all over body, check. I know you're excited to go to the beach and play in the water with your friends, but you need to wait for at least 15 to 30 minutes after applying sunscreen. It needs to sit there on your skin, so it will protect you from the sun optimally. Hey, that rhymes! If you think applying your sunscreen once in the morning is enough to last you the whole day, think again. Sunscreen (be it physical or chemical) loses it potency after (more or less) two hours on your skin. That means that the protection against UV rays wears off after that period of time. Even if you have SPF 100, you will still need to reapply it after two hours or after profuse sweating or after being exposed to water. Do you know that you would need at least a quarter teaspoon of sunscreen for it to be effective? Not a pea size amount. I blogged about it a couple of years ago, you're welcome to read about it here. However, that amount covers your face, neck, back of your neck, and ears. I sometimes even use it for my decolletage. I can assume your reaction would be, " Wouldn't it just waste my sunscreen? How many will I need to buy within a year then?" The answer lies in my next tip. Yes, you read it right. Your oldest sunscreen should be just one year old. If there is any sunscreen older than that, I suggest you introduce it to the rubbish bin. They should be good friends. However, if you wish to have a sunburn for the next fashion season, then feel free to continue using them. 1. American Academy of Dermatology. 2015. Sunscreen: How To Apply. [ONLINE] Available at:https://www.aad.org/dermatology-a-to-z/health-and-beauty/general-skin-care/sun-protection/how-to-apply-sunscreen. [Accessed 03 July 15]. 2. U.S Food and Drug Administration. 2015. Sun Safety: Save Your Skin!. [ONLINE] Available at: http://www.fda.gov/ForConsumers/ConsumerUpdates/ucm049090.htm. [Accessed 03 July 15].